Gorgeous on trend mod diamond design in colors of burgundy, aqua green, teal blue, and more Hacci sweater knit. Fabric is light to medium weight, a lighter weight jersey style weave, nice drape, and a good 4 way stretch and recovery. 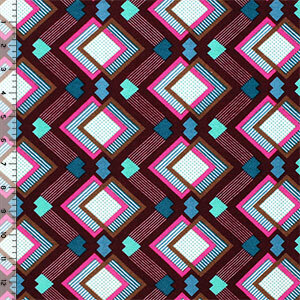 Pattern repeat measures 3 1/2". Hacci sweater knits are on trend and sew up like regular knits! Perfect for kimonos, tops, cardigans, beanies, scarves, swim cover ups, shawls, and much more.